Real Madrid third jersey for the 2018/19 season. Branded Adidas product in the standard replica version (code: DP5445). This is the primary model that is released to suppliers around the world. 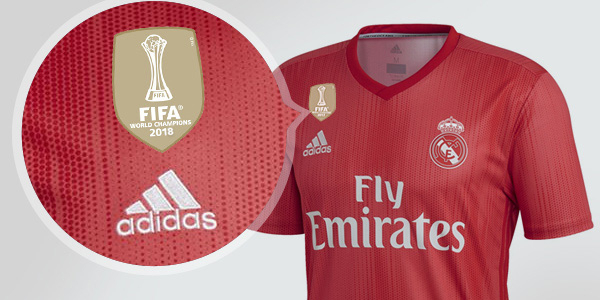 If you already own a Real Madrid Jersey, it is 99.9% likely a replica version. Up until the 2013/2014 season it was the only version available for purchase. The production uses ClimaLite technology which is designed to extract moisture from the skins surface and provide a comfortable fit to any supporter that wears it. 1. Authentic (manufacturer code: DP5441). List price: 134.95 €. 2. Replica (manufacturer code: DP5445) - you are currently viewing it. List price: 89.95 €.